Encino Businessman, Myron Ross continually surprises The Museum Community by his unique and important additions to our collections. Mr Ross, who is the owner of Heroes and Legends a company specializing in autographed celebrity memorabilia, adds these splendid examples of Valley history during World War II to The Museum's Library of San Fernando Valley Entertainment Industry History. This important photograph of Birmingham Hospital in 1944 may well have been illicit. At the time, the hospital was preparing for a massive influx of wounded American service personnel from the invasion of the Japanese homeland. Some projections estimated that the invasion might produce as many as a million American casualties. It had room for 1777 beds. The hospital also housed prisoner-patients, who were combat enemies of the United States. Photographing military installations in 1944 would have been considered a serious offense. I think I remember the Birmingham barracks. Were they off Vanowen or Sherman Way or one of those streets? I recall going to the ironing lady with my mom back in the early 60s or maybe late 50s. What street were they on? I think my father went to the Reserve meetings there too. Birmingham General Army Hospital was bound by Vanowen St, Balboa Blvd, Victory Blvd, and Aldea Ave. The entrance was on Vanowen St through the circular driveway and the administration building. 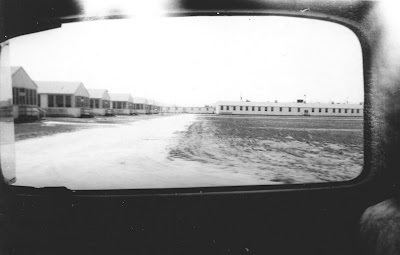 The barracks were all over the complex but could be seen from Balboa Avenue and from Victory Boulevard (which stopped just west of Balboa Boulevard until after WWII).